Mika Hakkinen Formula One Honour Postage Stamp. 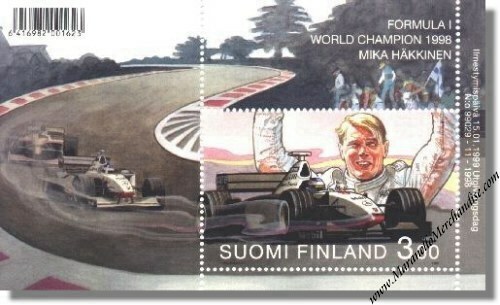 Official Finnish postage stamp, issued to celebrate Mika Hakkinen's first Formula One World Championship in 1998. Date of issue is January 15, 1999. It shows Mika in his McLaren-Mercedes with David Coulthard in the background. It measures some 2.5 x 2 inches in total.